I prepeare new project - 3D model of flat for my avatar. 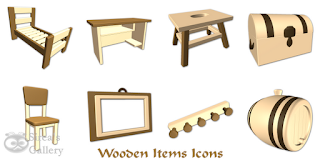 The wooden items is first icon set of furnishings. The set includes icons of Bed, Coat hack, Pc desk, Chest, Chair, Footstool, Cask and Frame.